For many decades our partner GROHE has launched countless new innovative, design-driven and award-winning bathroom and kitchen fittings to the market. The meticulous experts at GROHE are specialists in casting, electroplating, assembling, sanding and finishing their products to the very highest level. They combine genuine craftsmanship and focused mental aptitude to create a product beyond compare. In the Bathroom Grohe has the widest range of products for all water draw-off points and in three styles: Cosmopolitan, Contemporary and Authentic – each with a distinct look and characteristic, to satisfy your tastes. Even the Authentic style is very modern! The GROHE Retro-Fit™ Shower System transforms an existing shower head installation into a luxurious shower system. This system includes a shower head that swivels to the perfect angle. Additionally, the shower arm can be fixed or used as swivel and, it adds the convenience of a hand shower. Both feature GROHE DreamSpray® technology. Adding to the luxury experience is both the head and hand showers can be operated simultaneously. 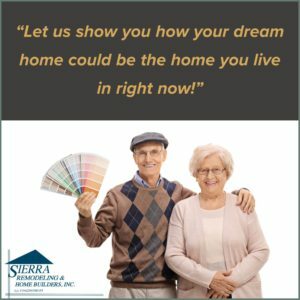 This Sierra Remodeling upgrade is usually quick since there is no need to change your tiles or remove any of your original work. It immediately creates a fully customized shower experience. After a Sierra Remodeling bathroom remodel, turn up your shower experience with SmartControl by GROHE! Enjoy a personalized and luxurious shower experience every day. Think of yourself as a DJ controlling a mixer only you are in the bathroom, controlling every aspect of your shower. Intelligently designed, intuitively controlled, the beauty of the perfect shower right at your fingertips. The innovative GROHE SmartControl technology lets you choose the outlet, the water flow and temperature as desired. Operation is simple and easy for the whole family – simply push to start and stop, then turn to adjust the water flow. your skin – as their gauge when constructing GROHE thermostats. The revolutionary thermostats ensure that hot and cold water will touch your skin in exactly the proportions you desire. GROHE TurboStat® is a revolutionary technical feature – it provides the correct shower temperature in seconds and keeps it constant. The many elegant design features in these miniature technological marvels are wonderfully safe and innovative! Grohe CoolTouch safety for the entire family! With GROHE CoolTouch® technology, the entire outer surface of the Grohtherm 3000 thermostat never exceeds the temperature of the shower water. An innovative cooling channel and special couplings where the hot water enters the thermostat and creates a barrier between the hot water and the chrome surface, so there’s no risk of scalding yourself on a hot chrome surface. The Turbostat and CoolTouch technologies are especially important safety precautions in elderly bathrooms.